Why Should You Upgrade to Windows 8. Windows 8 comes out on October 26th 2012. Microsoft has taken a huge step compared to its predecessors like Windows 7 or XP by replacing the traditional desktop with Metro UI. Although the touch-centric way of thinking has been widely criticized since the first release of Windows 8 developer preview, it has been welcome with acclaims from a huge group as well. But its no just a changed desktop that is packed with the all new windows 8. And if you are a Windows XP, Vista or Windows 7 user, here are some reasons that might tempt you to upgrade. The new Metro UI interface has got quite a lot of attention from all over. The startup screen with apps laid out as fully customizable colored tiles is sure to offer a new experience. It might be a hard to navigate at first, but you will get used to the fluid design pretty easily. An added advantage with apps is that with no taskbar or other screen consuming stuff, the full-screen apps gives you all the screen's real estate to work on. Microsoft seems to be the first of its kind desktop operating system to provide a store where you can download all sorts of apps. Although it doesn't provide any direct download of desktop software, all apps are verified by Microsoft and that means you don't have to worry about installing anything of malicious nature. The app updates are handled automatically by windows, so you won't get much upgrade popups to disturb you. 3. A new File System. 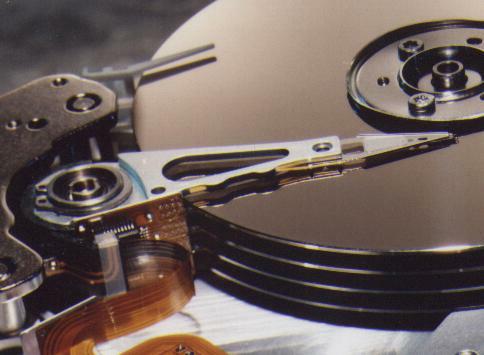 After introducing the NTFS file system, Microsoft has not released anything new for over a decade. This is going to change with the "ReFS" which stands for Resilient File System. As the name suggests it is resilient to damage and can repair broken parts of the harddisk by itself without interrupting normal activity. Unfortunately, ReFS might not be an option in the immediate release. But it is sure to get included in future after it has been fully tested and released by Microsoft. The file transfer window is now completely revamped. 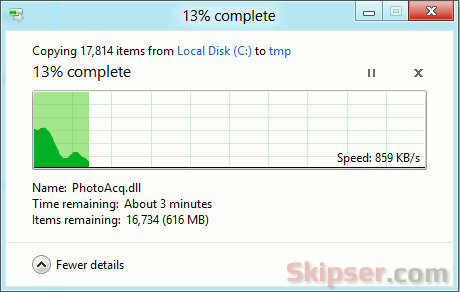 Windows 8 will show you the speed of transfer and the mean speed in real time. It will also show the number of items pending, their size and the remaining time. Another new feature is the option to pause and resume transfers. And if you initiate multiple transfers, instead of opening a window for each, all of them will be shown in the same window - makes sense. 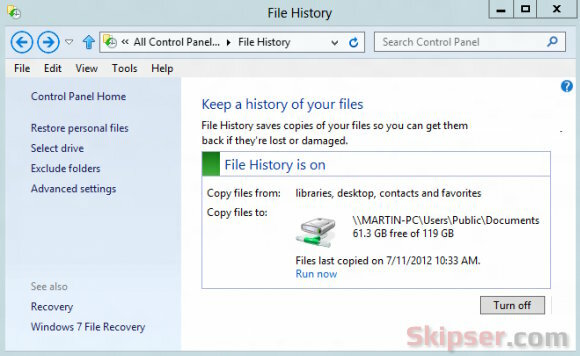 Windows 8 takes backups to new levels with File history. If you want to re-instate a backup, you can now choose a version of the file backed up and not just the immediate previous copy. You can store the backups either locally or on a network. Windows 8 lets you login either with local credentials or using a Microsoft account. The latter gives you additional power by getting access to cloud synchronization. That means whenever you install an app or change your preferences, they get synchronized and stored in the cloud. So the next time you try logging into windows from a an internet cafe, you automatically get all your language preferences, personalizations and settings as windows 8 will fetch it from the cloud. The same goes for apps as well. You might notice many Windows 8 apps asking you for Windows Live credentials and tell you that logging in will give you the best experience. It's true! Once you log in, all data from the application is stored automatically in the cloud. That means even if you open the app from another computer you get a seamless experience. 6. Carry your Windows around. A new feature in windows 8 is called "Windows to Go". That means you can install a bootable version of Windows 8 into a storage device like your USB drive. This allows you to take your windows where ever you want and run it on any computer. Just plug the USB in and boot from it and you have your Windows ready to go. You need not worry about accidental knock offs as well. If you disconnect the drive, Windows freezes itself automatically and just continues the next time you pug the USB in. With apps, windows 8 tries to bring viewers and support for most of the common file types like pdf. Apps like pdf reader will enable you read pdf files without having to install any third party softwares. 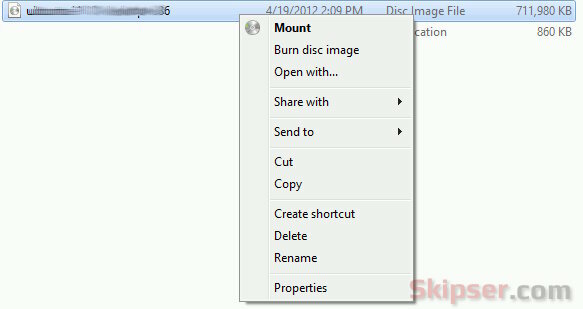 A nice addition to the list is the support to mount ISO and VHD disk images directly. Once mounted, they will appear as normal drives in the explorer. Although the hardware support has got better and better with each Windows release, there is something special about windows 8. Microsoft has remodeled the thread scheduler that makes sure that the multicore processors work with an increased efficiency. This will be of great help in the case of AMD processors as it is known that these processors do not perform very well with Windows 7. There are a lot of other smaller features that you are definitely going to notice while you need them. A few include native USB3 support, increased security, more and better games, integration of common social media tools like Facebook, twitter and much more. On the whole, the features look promising and useful. Metro might be a bit hard to get used to, but the apps make it worth getting used to. The performance improvements are definitely make AMD fans happier and increased native file handle support means lesser third party software to install. So what do you think. Is there some thing that you think I have missed? Please do chip in with comments and I will surely add to the list. 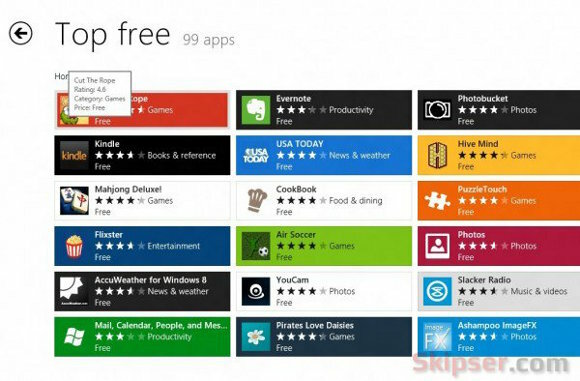 Great article - however, Microsoft is not the first OS with an app-store-like functionality. Ubuntu has had it for about 2 years now. Otherwise, a persuasive article to switch to Windows 8. Feeling settled and happy with your Windows 7 or XP? 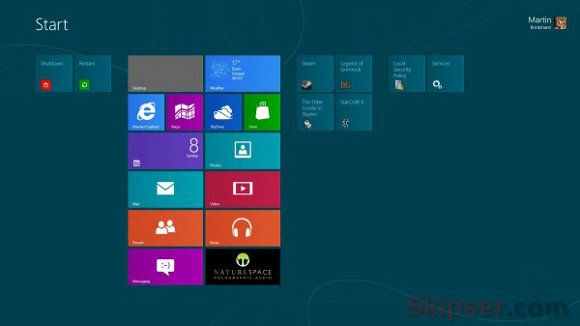 Here are some reasons that might tempt you to upgrade to Windows 8.